Dealing with local water quality — Kevin Potter. The quality of water in an area, particularly its hardness or softness, necessitates a range of approaches to preventing corrosion in water heaters. Kevin Potter explains what you need to know. Water heaters are susceptible to corrosion. Protection is readily available, yet is dependent on water type and composition of the area of the country they operate in. But how do these characteristics and manufacturing materials come into play? Water hardness varies across the UK. Scotland, south-west and north-west England and the west of Wales are typically soft-water areas, but this changes as you move further east. There are implications for the choice of hot-water system, as well as the maintenance regime. The make-up of the water and the material of the tank/cylinder causes different reactions within the unit. Hard water contains more dissolved mineral ions, such as calcium and magnesium, which improves its conductivity. This is relevant for hot-water cylinders. Fresh water carries oxygen which is a major contributor to corrosion in heating and hot-water systems. The glass (enamel) lining within some domestic-hot-water cylinders is the primary protection against corrosion. However, despite careful manufacturing processes, microscopic cracks in the lining are not completely preventable. This means that small areas of the steel cylinder shell may get exposed to water, and there is opportunity for corrosion to take hold. To stop this from happening, it is essential to install anodes for protection. These can be either sacrificial or electrical/powered anodes. A sacrificial anode (left) is effective in hard-water areas, whereas a powered anode is required in a soft-water area. A sacrificial anode, by virtue of its name, ‘sacrifices’ itself for the benefit of the cylinder. The protection mechanism is based on an electrochemical process. 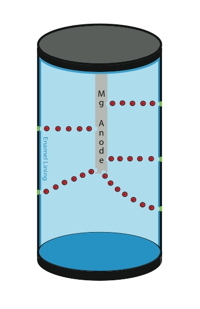 Water serves as an electrolyte and the cylinder’s steel shell (less reactive metal) as the cathode; a magnesium (more reactive metal), anode is installed. The latter, once submerged in water, offers a target for oxidisation in lieu of the steel shell. The electrons that are freed during this corrosion process travel through the conductive medium (water) to the cathode (steel shell), reducing it to its elementary form, thereby protecting it. In hard-water areas, sacrificial anodes work well, thanks to higher conductivity caused by higher concentration of metal ions. It is thus the protection of choice. Such anodes require maintenance and, due to the varying quality and chemical constitution of water, corrode at different rates depending on the location. These area-specific factors form the basis for an assessment of the rate of deterioration and when regular inspection is required to check the state of the anodes. But how does soft water change this situation? Soft water is more pure than hard water and has low electrical conductivity due to a lack of dissolved metal ions, reducing the electrical flow from the anode to the cathode through the water. This adversely affects the chemical reaction between sacrificial anode and cylinder shell, inhibiting protection. When inspecting the anode in these applications, it is likely to appear in excellent condition. However, this may be an indication that the anode is not working and the heater is at risk. This is where either a powered anode would be needed or a different cylinder selected. Simplified illustration of a water heater. Electrons (red) move from the corroding magnesium anode (grey) to exposed areas of the cylinder’s steel shell (green), protecting them from corrosion. A powered anode is non-sacrificial. Instead of the anode giving up its own electrons and producing an electrolytic current, such as in the case of a sacrificial magnesium anode, an electrical supply produces a very low current in the water. This has the same protective effect on the cylinder’s steel shell but without corroding the anode. The anode is often made of titanium, which will theoretically last the lifetime of the hot-water cylinder. However, a powered anode in certain soft water areas may still not have a protective effect, as the conductivity of the water, which the powered anode requires, is often poor. This is why stainless-steel cylinders are often used in these parts of the country. Calorifiers made of stainless steel do not require anode protection as they are not susceptible to corrosion. This makes them particularly suited to areas such as Scotland, south-west and north-west England and the west of Wales. This gives peace of mind that the calorifier is being protected, as the user might not be aware of an installed anode not providing any protection. Whichever method of protection or type of cylinder is chosen, some form of maintenance is always required to ensure a safe and efficient hot-water system. This reduces the risks of legionella and scale forming within the system and prolongs the life of the product. Hard water benefits from better conductivity which makes sacrificial anodes as means of corrosion very effective. In soft-water areas, where conductivity is lower, a powered anode can be used with the same effect. However, if the soft water has extremely poor conductivity so that even powered anodes do not have the desired effect, corrosion-resistant stainless steel cylinders are a good choice — without the need for an anode. Kevin Potter is business-development manager for hot-water solutions at Hamworthy Heating.